Thanks, Louis! It was fun to have you in our home, celebrating the babies with us. :) We love the photos! Chaos is about to erupt! It's nearly feeding time around here. We have all the babies on mostly the same schedule so far, so it's an hour or so of insanity (and need for heavy volunteer help), then two hours of "down" time to catch up with other stuff. So they are waking up and I will just attach some pictures and call it quits for tonight. I also wanted to say thanks for continuing to pray for our darling Seth. (The only new pictures I was able to get of him aren't good as he was getting upset at me. Maybe tomorrow?) He is doing really well, though is fussy sometimes (a normal baby), still on a CPAP of 6 but only requiring oxygen in the 30's. Today he got all the way down to 31% at one point; when I was there yesterday he was on 33! It thrilled me, of course, and I was praising God as I thought back over the weeks when we thought we might lose him. Please continue praying for his protection from infection and for healing for his lungs. We want him home with us and trust God will continue to provide the help we need when we transition from quads to quints. It's been amazing to see how last-minute/timely His provision has been with regards to volunteers; also amazing to look at the schedule and see how many people have committed to give up their precious time. We are deeply, truly humbled and very, very grateful for His provision in so many ways through so many of you! I love these onesies. They say: "Diaper loading, please wait . . . " So true in the case of Will last night! Amazing size difference, no?! 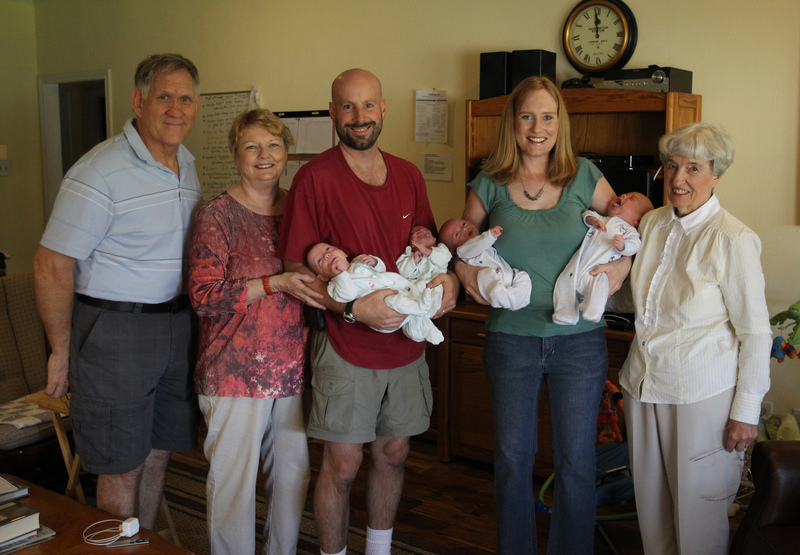 Will is 10 lb 11 and David is 8 lb 11. Little Christmas dolls! Gracie kept thinking Marcie's shoulder was something to eat. Because you can never have too many pictures of cute babies. We need your help! Can you please spread the word to your family and friends that we are in need of more volunteers? We have needs for daytime, evenings, overnights and weekends. Additionally we will need help filling spots last minute when volunteers become sick. So please, please send facebook notes, emails, etc that help is still needed and to please contact me at jonesquints@yahoo.com for more information. Also, we have a few volunteers who we are trying to fly in from out of town and are wanting to see if anyone would be willing to donate air miles for a round trip (25,000) or one way (12,500 miles on American, not sure of amounts on other airlines)? That way if they become sick, we would be able to re-schedule their trip easily so that they could actually be helping with the babies when they get here. Please contact me if you are willing to make a donation. 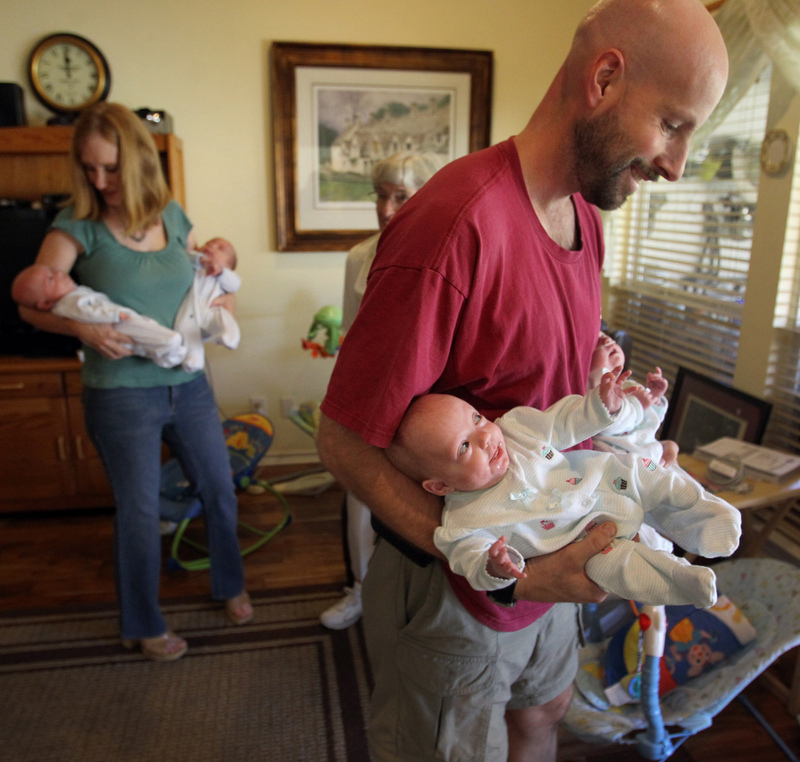 This morning's Dallas Morning News paper featured an article about the babies! 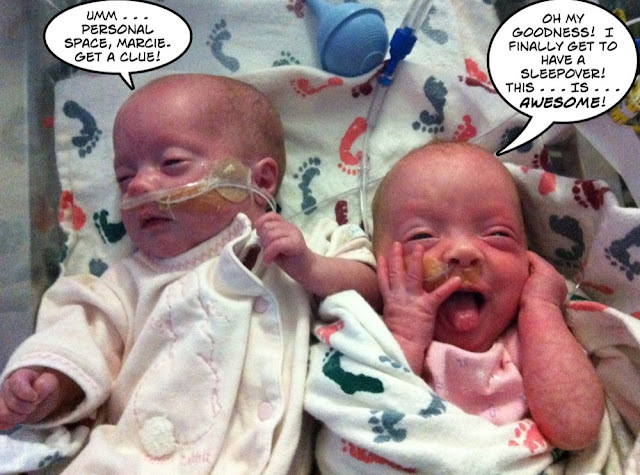 It was well written and there are a couple good pictures of the babies. Here is a link to the article, but unless you're a subscriber, you'll only see the first picture and first part of the article. The babies in that picture, from left to right, are Marcie, Grace, David, and Will. The second picture that you don't see is similar to one that we've already put on the blog of the four babies lined up in their cribs sleeping. Thanks, James, for a job well done on the article! Seriously, I love the thigh fat rolls and little bums! I think especially because, as my brother said, "They are starting to look less like spider monkeys and more like babies." (He then did a very accurate pose reminiscent of them stretched out, apparently comatose, immediately after birth under the NICU warmers.) I love the little legs, the naked tummies, I love the BABIES!!! Much easier when one is reasonably well-rested, thanks to wonderful volunteers who I cannot thank enough (and could use more of, just sayin' . . . ). I hear babies stirring, revving up to be fed, so will just ask that you please pray we figure out what's going on with Marcie. She's becoming more and more reluctant to eat, or rather will eat just one ounce, then stop, and if we "force" her to eat more she spits up. Maybe reflux, like Will, so we're trying his formula out on her. The domino effect: You remove one baby, the rest just topple! We truly enjoyed our Thanksgiving Day yesterday and hope that yours was wonderful too! Though these five babies are keeping us on our toes and constantly challenging us, they are a perfect reminder and example of how blessed we are. God has given us so much for which to be thankful! What an amazing thing to know that the one true God who created all the grandeur in the skies above us and on the earth around us also deems to love and bless us with so many good things when we have no merit at all! He is good and we are thankful! Thanksgiving dinner-- out on the porch. Yes, the weather has been in the 70s and even 80s lately! Marmi (Marcia) and Marcie, her namesake. I shot this yesterday afternoon shortly after Will arrived home. 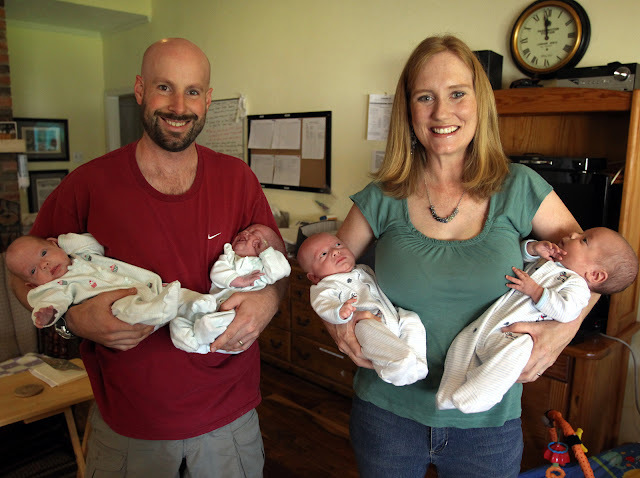 After the chaos of feeding them, the quiet of four sleeping babies couldn't be any louder. 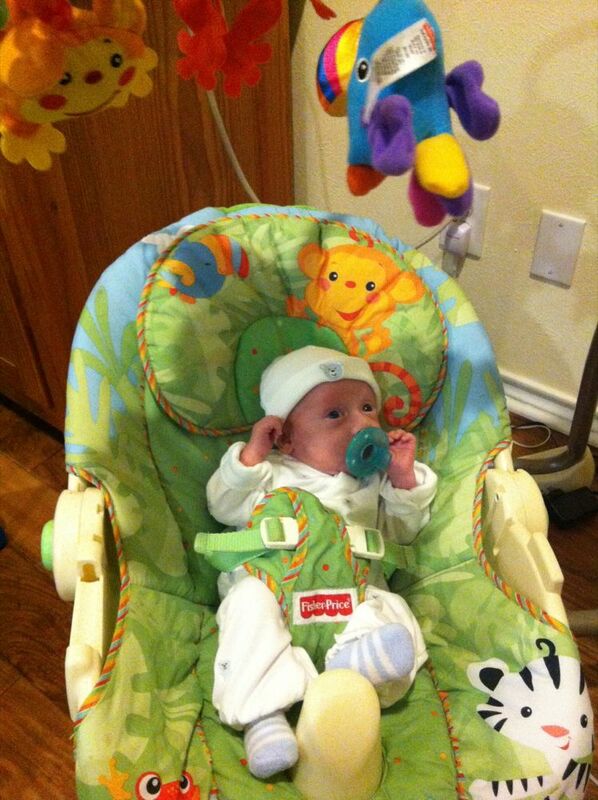 Will arrived in the same stork this afternoon, ending our long, long stay at St. Paul hospital. 103 days, to be exact. 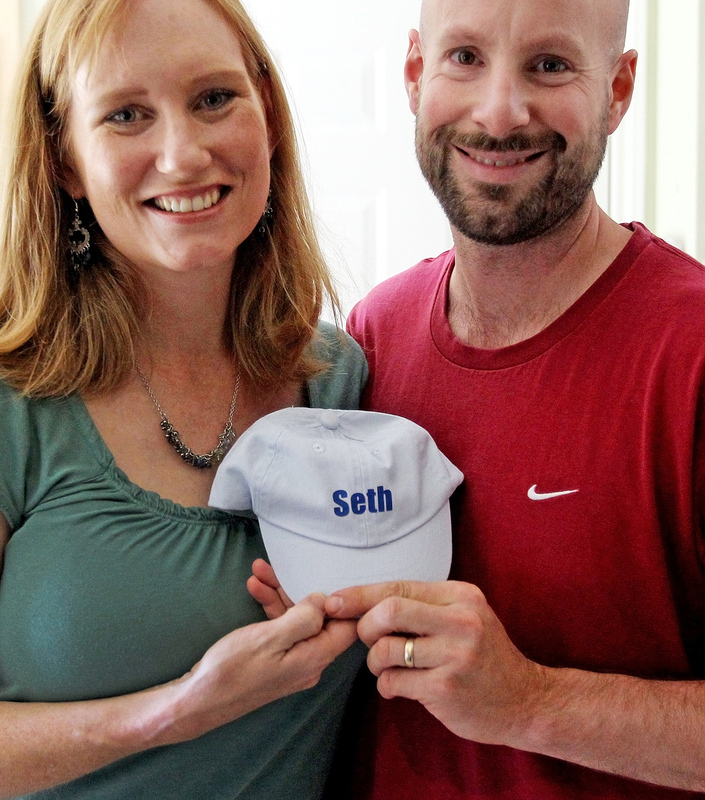 Of course, Seth is still at Children's, but that will be for a while yet. Our memories of our time at St. Paul will be fond, even as they were challenging and hard many times. The people there have been absolutely incredible in their professional, lifesaving care of our five babies and we could not be more thankful. Many have become true friends and all are so appreciated. We'll bring the babies back to visit when we have a chance! our babies over the last 3 1/2 months! Jones Quint Corner: This used to be bustling with quintuplet activity, but is now just full of empty beds! Gavin writing. I would appreciate prayers specifically for my patience level. As I'm sure is common with many people, when I am extra tired, my patience is pretty thin. Lately, even when I'm not so tired, I've been frustrated with my lack of patience. Usually it is in regards to the babies or to Isaac when they are not doing something logical or what I think they should be doing. Well, babies aren't logical and they don't know what they should be doing. Knowing that and putting the understanding into practice is tough for me. I love my little babies like crazy, but at the same time am not a natural "baby person." Not doing my normal flying job or being "home" of course adds to the frustration. I know God has us here and now in this specific situation for a wonderful purpose and for our good, but at times I really don't feel that and even have a hard time understanding it. If you think of it, prayers for these areas would be highly appreciated. I know I am not the only one out there going through challenging times, so I don't want to be asking for a pity party. At the same time so many people have asked us specifically how we are doing and how they can pray. There you have it! I thought I'd keep the trend going with the post title. Yes, Grace Elise arrived home yesterday evening, borne safely to her nursery in our Chrysler "stork." She's doing great and eating VERY well, for which we are grateful. She is on an oxygen machine (which I have dubbed "Vader," due to it's breathing sounds) through her cannula, but it is not actually necessary for life support. It's just boosting her oxygen saturation a little bit, especially when she's eating. She is on six different medications that are spaced differently throughout the day, so that's a big change in workload as far as preparing her bottles as compared to David and Marcie's relatively simple preparations. (We prepare the bottles and add the medications ahead of time, so don't let that scare any volunteers away!) Fortunately, she eats so quickly, it's not a problem. Marcie, on the other hand, is extremely slow and challenging to feed, which we hope will change soon-- a current prayer request. David and Marcie were in bed, otherwise we would have included them. We'll try to get a picture of all four babies with us at home tomorrow. (Gavin again): We are doing pretty well at this point, starting to get a system figured out and INCREDIBLY thankful for the help that we have thus far during the day and overnight! (Carrie): Deb has done 2 overnights, and what a difference two full night's sleep make to my mental and physical stamina! Other wonderful volunteers allow me to sleep in after nights I have been up or didn't get to bed until late (2 am last night). Still others do our laundry, make our meals, clean our house, entertain Isaac, and much more. WE COULD NOT DO THIS WITHOUT YOU, including you prayer warriors and generous partners in this journey. (Thank you for the diapers, Sandra's Bible study!!!) Seriously, at times I get so overwhelmed by the road ahead of us I think, "Dear God, help us!" and realize immediately how abundantly He has and continues to! Regarding Seth: What a little stinker! He got so worked up about getting his outfit changed today that he projectile-vomited right into my hair as I leaned over him. I can smell it now. :) Lovely. It's delightful to have him so healthy he demands attention from his nurse, his mobile, his bouncing chair, etc.! He has been hovering around 40% oxygen requirement and is on a lowered CPAP setting (7 instead of 8). 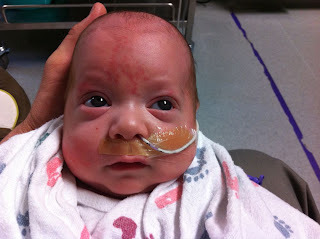 I look back to where we've come from and stand amazed at the grace and power of the Lord in healing those little lungs! He's no longer retracting at all when he breathes. He's fully weaned off of his sedation and pain meds, I believe, so we praise God for that, too! Thank you for all your prayers, and please keep them coming! We had a long day at the hospital and didn't end up bringing Grace or Will home. 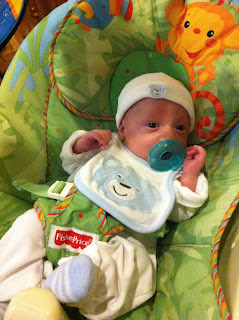 Will is still not ready, taking forever to feed. 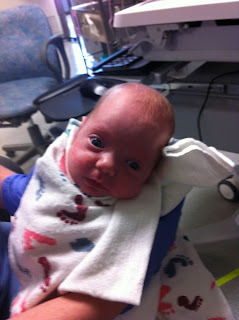 Fortunately, he is doing better and able to keep the formula down now that his reflux issue is addressed. Grace is ready, but the meds that we need for her were not available at our pharmacy. We'll probably bring her home tomorrow. We were just worn out anyway, so the thought of driving up to North Dallas in the evening already to get the meds from the one pharmacy that had them and then coming back to get Grace, then driving home to our other two babies who are often a bit fussy . . . you get the picture. Carrie had a rotten night's sleep last night (and mine wasn't too good either) with David being quite fussy. Thank you for your prayers as we figure these babes out, how to feed them, how to split up our sleep, etc. Will and Gracie coming TODAY! You'll note the infrequent posts from me nowadays with more babies at home, including Grace this coming weekend on oxygen and a blood oxygen monitor that will alarm if she pulls her cannula out of her nose. :} She's eating great, though! Seth had a rough couple of days with some more withdrawal symptoms, so was given another weaning dose of methadone to help him through it. I got to give him a tub bath two days ago - what fun to strip him down to nothing but his cannula and bathe his pudgy body in the warm bedside baby tub! I told the doctor it made me feel like a real mom. I loved cuddling him up in towels and dressing him afterwards. He seemed to enjoy it all, too! Thank you a million times over for your continued prayers. We are SO thankful Seth has been able to remain on CPAP only! His oxygen requirement was at 50% just now when I called, but he's been as low as 40% from time to time. He is growing increasingly relational, which increases our need/desire to be with him. Volunteers at home are more critical than ever and immensely, intensely appreciated! We are still in need of baby caretakers if you are at all available and able - or if you'd like to donate to a "nanny fund" in lieu of coming yourself. For those who are hesitant due to some fearfulness, please be assured our babies are no longer scary-tiny preemies; they are 2-week-old normal-sized babies (except Will, who's huge, but still too sluggish with eating to come home; they suspect painful reflux is the cause so put him on special formula). Even Grace with her oxygen cannula and monitor is very low maintenance, and Lord willing she will be on it only for a short while longer. Our particular needs include a night volunteer every other Friday night (Gavin and I will work with the night volunteers; see below for how we're working it - we just need an extra set of hands to make it when 4 are home!). We also need standby night volunteers in case one of the regulars gets sick, and a few additional daytime volunteers. Please email jonesquints@yahoo.com to let Stacey and us know if/when you can spare a few hours. This is a very humbling thing to have to be so needy, but if in order for me to continue to function and pump for Seth, I truly do need the help!! The volunteers who come in the morning, enable me to recoup the sleep missed the night before. (I'm awake anywhere from 12:00 to 2:00 a.m. doing the final bedtime feeding, then up again for the early morning feeding anywhere from 4:30 to 6:00; Gavin, God BLESS him(! ), does the 3:00 a.m. feeding, then is up before 7:00 to get Isaac to school and head to work at the SIL Center - or deal with the myriad of baby and healthcare details and paperwork, if it's piled up to the point he needs to take a day off.) The afternoon volunteers allow me to get up to Children's Medical Center to be with Seth, who, as I mentioned, is needing his mom and dad more and more. So I'm laying it out there, being transparent and very needy! :) Again, we cannot thank you enough for all the prayers, notes of encouragement, gifts, acts of service, diapers, and more. Please forgive me if a thank you note has not yet arrived, or if I let it slip through the many cracks in my mind. We thank God for each and every one of His provisions through you! We know He will continue to supply all of our needs according to His glorious riches in Christ Jesus. To Him be all the glory - we stand amazed at what He has done, excited about what He is going to do, and filled with gratitude towards Him and you. And then there were 5 . . . Yes, Marcie came home today! She's doing well after a few hours at home and hopefully can teach David some lessons on calming down and sleeping in the evening. I'm exhausted so I'm heading to bed ASAP, but here are a couple pictures. Will, Grace, and Seth are doing well. Sorry for the few days of silence. After Carrie's one night with Will in the hospital on Friday, it was pretty apparent that he indeed is not ready to come home. He just really isn't taking his full feedings well, even if he wakes up screaming with hunger. He tires out too quickly and it really takes a long time to fill him up. Though we keep saying this, we really think Marcie will likely be coming home this week. She's doing great and eating well. Grace, too, is eating well and progressing. She is actually catching up to Marcie on her feeds, so she might be in the running for being the next to come home! She's still on a tiny bit of oxygen, but it's the type that she can come home on, so that's a praise. Of course, we'd love it if her little lungs grow out of their need for any additional oxygen. David continues to do well at home, though he's "waking up" a bit more. He's awake a lot in the evenings and gets a bit fussy. We're just trying to find out what his needs are and aren't and how to best help him. It will be quite a job to figure all the babies out as they come home while still attempting to keep them on a schedule. Thank God for His enablement and wisdom! Seth yesterday was doing very well. Carrie said it was the first time she had seen him breathing normally without labored breaths. He was wide awake and alert for several hours and seems to be looking for more "input." So he'll be spending time in swings or bouncy chairs so he can see more of his world. 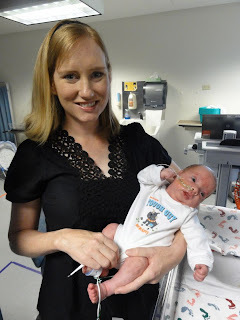 The others have been doing the same thing in the other NICU and at home, so it's good that Seth now is needing and getting the additional sensory input. Today he was moved back to the NIPV (non-invasive pulmonary ventilation) machine from the CPAP because he was not breathing as well. 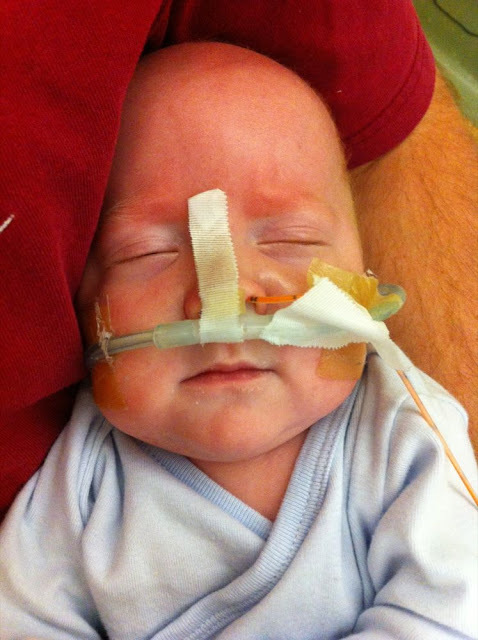 Though that is a bit of a regression, he was needing a lower percentage of oxygen today. The roller coaster continues . . . . He sure seems happier and less touchy than he did in weeks past, so that's a praise. The head neonatologist said that he still has very severe chronic lung disease, of course, and advised patience again as we wait for him to heal. After Carrie's night by herself with Will, getting up to feed and take care of him as well as pumping for the rest of the babies, it became apparent how absolutely critical it is that she get a good night's sleep. Two hours here or there just isn't sufficient at this time as she doesn't have any reserve. Friday was not a good day; she had severely decreased ability to cope with our current reality. The accumulated stress of having a very sick baby in one NICU plus three others in another hospital and a fussy little guy at home in the evenings, not to mention Isaac, is stretching both of us. We are already SO thankful for ALL the volunteers who are helping us in so many ways, including those enabling us to stay sane by allowing us to sleep more at night once more babies come home. If there is anyone else out there willing to take nights (even if we fly you to Dallas for a time), we'd sure appreciate the help. Grace and Marcie getting to know each other. Carrie texted me from the hospital where she's staying tonight that Seth has been moved back to CPAP, which is a step in the right direction. When she left the hospital to go back to be with the others, she said he was very happy and on lower oxygen settings. We praise the Lord for this step closer to health, but know it can continue to ebb and flow. David continues to do well, but seems to be constantly struggling with constipation that tends to bother him in the evenings especially. We pray that we can figure how best to help him with that. As with Carrie, I am definitely getting a reality check about what it will mean to have several kids at home. With David's fussiness tonight and trying to figure out to help him, it was a bit scary to picture four additional babies with their own unique "issues" and personalities. God alone will be able to give us the strength and patience we need. Thanks for praying! Seth has remained stable on his oxygen and machine settings, and I thought he looked like he was breathing a bit more easily yesterday. I pray he continues to hold his own and can avoid any more steroids or increased settings. One huge thing is remaining infection-free; it's truly a HUGE provision from the Lord that none of our kids have gotten "colds" or other infections that could have been devastating! We praise the Lord for that and pray it continues, if He is willing. Thank you for praying! Another prayer request is that I will be "living" at the NICU for the next couple of days, trying to get Will out of there. He's so huge (nearly 9 1/2 pounds), but not taking the bottle great still, so they are letting me demand-feed him while rooming-in next to the NICU. If he gains weight two nights in a row I will be able to take him home! Marcie should be cleared to go as soon as her stamina is such that she can eat what she needs to in a 48-hour period to be able to gain weight as well, and assuming she doesn't have another "bradycardia" (dropped heart-rate from forgetting to breath or choking on spit-up) like she did yesterday. Monday would be the earliest day for her homecoming. And Grace is doing the best of the three on her bottles, but still needs a little bit of air flow and oxygen (although last night they were able to turn off the oxygen for a while). So we pray her lungs heal up quickly, allowing her to join her siblings at home SOON! He loves this mobile on a swing from Marty - thank you! Will's newborn shirt says "Daddy's Tough Guy" and is already tight on him! Marcie in her "shrug" and hat from Arlene. Darling! Her sister was asleep, so I didn't dress her up. 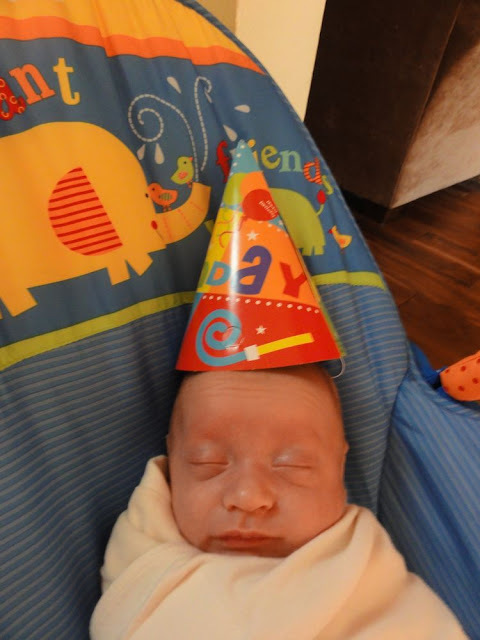 Just so you don't think David was left out of the "party," here is his picture. It was kind of early in the morning, so he wasn't quite in the mood. I just talked to the nurse practitioner for Seth (7 lb 4 oz); she says he is still working too hard to breathe so they went up on his machine pressures a bit. They are considering steroids yet again in order to try to avoid having to re-intubate him and put him back on a ventilator. We are praying fervently that he will not need that, please God! But as Isaac said tonight, God knows what is best so we don't need to be afraid. The next 24-48 hours "should" tell us which way he's going to go: worsen or stabilize/improve. So far, this improvement has been like 10 steps forward and 5 steps back; as the NP pointed out, at least we are netting a gain, Lord willing, and she's proud of how well he's done off the ventilator. These 2 weeks have given his lungs time to heal better than they would have on the ventilator. Still, we would LOVE for him to remain on the non-invasive cannula and continue hearing his sighs and grunts and even cries (hoarse though they may be). God is ALWAYS good, all the time! Pretend Gracie (left) and Marcie are in a photo booth together. :) We think they look a lot alike. Marcie eyeing her pacifier after she lost it. I think she looks like Will sometimes, especially as she fills out. Marcie LOVES to vocalize and engage with people! Will: Is the photo shoot over yet? Seth: No these aren't grapes in my cheeks. I'm a growing boy, ok? Marcie: All right! I'm in the mood to party. Where's the root beer?